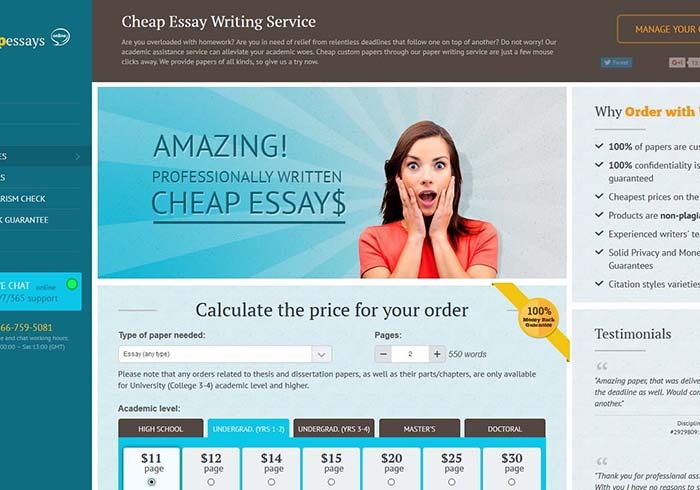 If you are looking where to buy cheap essays UK list of websites will offer you to check cheapessaysonline.com. This service provides the customer with the products of academic writing. Here we prepared a review for potential customers of cheapessaysonline.com. From the first glance, the website cheapessaysonline.com seems quite kitschy. This is a special kind of kitsch when the website’s creators were trying to fit all possible information on the main page. There are various sections, which will tell you why this website it worth consideration, the testimonials of the customers and menu with links to other website’s sections. Unfortunately, there is no way to leave a testimonial or review by your own at the website. However, you are able to contact the live support in chat and they will, probably, help you with any question. Basing on the information that we have received from the customer support, the company is international. It means that there are cheap essays online UK English, US English and from other countries. Here you are able to get a writer from the UK, US, Canada, Kenya, India, Canada, Australia and so on. This fact means that it is easy to get ESL writer without knowing it as you are unable to select the writer by your own. There are various types of papers that you are able to order at the website. The orders are made through the form at the website. However, there are just few types of papers that are specified in the required field. The prices after calculations are not too cheap. You are able to find a lot of less expensive services in the web. Unfortunately, there are no services like editing or proofreading. It may mean that you would need either to pay the price for of writing from zero for just your paper refinement or to look for a different service. Although it is stated that “24/7/365 Customer Support” can help you with any issue there are some time restrictions for live chats and phone calls, which means that you would not be able to reach the customer support at any time. This is also inconvenient if you have a different time zone and need to contact the service representative at the time, which is comfortable for you. The revision policy regulates the conditions under which you are able to get your order refined. The disappointing thing is that you have only 7 days for the revision without payment. Every student knows that usually papers are submitted and checked by profs within a longer period. Money back policy specifies the cases, in which you are able to get the partial or full refund. Also, there are situations when you are unable to get your money back. It is stated that the papers are original, according to the “plagiarism-free guarantee”. We hope that this Cheapessaysonline.com Review has helped you to take the right decision if you were still hesitating which service to select.